From left: Maria Royce, senior vice president, strategy and market development and chief strategy officer, WellSpan Health; Karen Jones, M.D., senior vice president, WellSpan Health, and president, WellSpan Medical Group; Vicky Diamond, vice president of ancillary services, WellSpan Health; Kevin Mosser, M.D., president and chief executive officer, WellSpan Health; Steve Hovis, chairman, WellSpan Health Board of Directors; Tom McGann, M.D., executive vice president for clinical practice, WellSpan Health; Charles Chodroff, M.D., senior vice president of population health and chief clinical officer, WellSpan Health; and Charlie Thiemann, project manager, Alexander Building Construction, gather to officially break ground for the WellSpan Hanover Health Center. 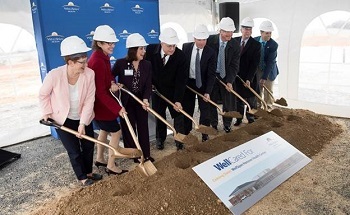 WellSpan Health physicians, leaders and staff today joined with community members to officially break ground on the new, 80,000-square-foot WellSpan Hanover Health Center project in Penn Township, York County. Announced in August, the $49 million health center will house an outpatient surgery suite, lab and imaging services, and primary care and specialty physician offices. The facility will be constructed at 1227 Baltimore St, Hanover. The first stage of construction will be of a surgery suite that will include four operating rooms and four specialty procedure rooms, along with more than two dozen private pre-op and post-op patient rooms. The suite will offer the latest in bariatric, gastrointestinal, oncological, gynecological and orthopedic procedures, including joint reconstruction. Diagnostic imaging services will include ultrasound, X-ray, CT scan, 3D mammography and MRI. The second phase of the center will include primary care and specialty physician offices in the areas of cardiology and OB-GYN with up to 36 patient exam rooms and treatment areas. The WellSpan Hanover Health Center is expected to open by fall of 2018.